Navan Cenotaph​, newly unveiled in 2010, ​​and a ​Canada 150th celebration Honouring our Fallen Soldiers One Red Maple at a Time​. Five red maples were planted at the Navan Cenotaph in November 2016 to honour residents of Navan who served during the Boer War (1899-1902), World War 1 (1914-1918), World War 2 (1939-1945), and UN/NATO Operations, along with a walkway, bench and descriptive plaque. Country Moments Spa & Wellness Centre, located in a beautiful, old Victorian farmhouse built in 1876 on the northwest corner of Trim and Smith in Navan, they offer full esthetic services, massage therapy, and so much more. Navan made it into the Guinness Book of World Records for their accomplishment of the 50-Horse Hitch. A statue has been erected in front of the Fair Office on Colonial Road at Fairgreen of the two lead horses, Tony and Duke. Navan Centennial Park, 1279 Colonial Road - behind the Navan Curling Club - access from the curling club parking lot. The park includes a softball diamond, swings, children's climbing structures and a tennis court. St. Mary’s Anglican Church (corner of Trim and Smith Roads) – built in 1898 with stone from a nearby quarry owned by Robert Shaw. The New Oak Tree: The building The New Oak Tree is housed in was originally built in 1915 by Walter Bickerton who bought the land on the south road (Trim) from his uncle, William Wall. He erected a small building to serve as a grist mill. n 1917, before leaving for Saskatchewan, he sold his property to Hugh Lancaster who operated the business until 1930. It was then taken over by Edlow and Urban Lancaster who started the Lancaster Brothers Feed and Seed business. After first doing custom grinding, the building was enlarged to house a feed store. In 1944, they built and equipped an elevator which turned out to be a great asset to the community. The two brothers continued to operate the Feed and Seed business until they sold it in 1973. Several other owners have bought the property over the years. One fall, Don Murray paid a visit to Navan where he found out the Old Navan Feedmill property was up for sale, and began converting the former restaurant into a furniture store, The New Oak Tree, offering handcrafted solid wood furniture. J.T. Bradley’s Country Convenience Store, first established in 1898, and re-built in 1949 after burning down in 1948. Deavy’s Garage – on Colonial near J.T. Bradley's, - painted and decorated in 2000 before the 2001 International Plowing Match. The Domes, which were used at a Papal Mass by Pope John Paul II when he visited Ottawa and are now installed in the Navan Fairgrounds. They were moved in my helicopter from Lebreton Flats. The Prescott-Russell Trail rest area near the intersection of Smith Road was named after OPP Constable Harold H. Dent who was murdered by a foreign national while on official duty June 20, 1940, at the Navan Train Station, after he confronted a reportedly suspicious stranger. ​Acting Sergeant J.A. Stringer was able to pursue the suspect and after being fired upon he shot and killed the assailant. The Prescott Russell Pathway - Bring your walking shoes and pack a picnic lunch. The Prescott-Russell Pathway is a shared-use pathway that stretches from Mer Bleue, along an old railway bed, and past city limits into Prescott Russell county. The pathway is for use by walkers, joggers, skiiers, snowshoers, dogs (must be on a leash), cyclists, horse riders, and snowmobiles (subject to City of Ottawa policy). Motorized vehicles are banned from the pathway, with the exception of mobility aids including wheelchairs and scooters, emergency response vehicles, and city-authorized maintenance vehicles. Parking is available at three different locations; the closest to Navan is on Smith Road, along with a picnic table. Trail rules are posted. The trail and surrounding area is home to much wildlife. Watch for a wide variety of plant life and wildlife including beavers and beaver ponds, large and small birds, turtles, frogs and numerous other animals. The Montreal & Ottawa CRP railway line – or M&O – opened in the late 1800s, and the Navan Railway Station in 1898. The rail line was operational until 1974. 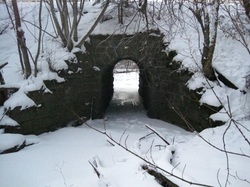 The tracks were removed in 1986-1987, when the line then became a recreational trail.